When I get offered Christian books to review, that usually means Amish romance novels. 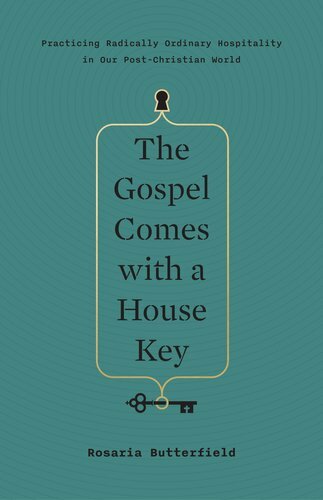 So when I saw this upcoming book by Rosaria Butterfield on offer, I was genuinely pleased. Hospitality is something I've been thinking about a lot for the past few years: how to receive it, how to extend it, how to make it part of Christian home life as a reflection of the spiritual life we share, and how to invite outsiders in. A bit of background on Butterfield, if you're not already familiar with her other books: she is a former lesbian/radical feminist/activist. In these circles, she had a community, one that loved and accepted her and extended hospitality. When she converted to Christianity, not only was that hospitality no longer available to her, there was no such corresponding hospitality available within her new community. Thus, this book. The overall theme is simple. Stop waiting for someone else to step up. Step up yourself. I can't say I disagree, I'm just still not sure how to make that happen in my particular circumstance. A typical week for them will include hospitality extended day and night—people coming and going, neighbors in crisis, long-term guests, church events, travelers in need... the list goes on. It is not uncommon for them to post to the app and invite the entire neighborhood over for a barbecue. She describes her need to recharge being met by rising in the pre-dawn hours, so she can have a snippet of time alone to do devotions. With children at different ages and stages of life (I believe she homeschools the ones who are still at home), it sounds like their days as a family are packed. Her husband is a pastor, and they're heavily involved with their church. Hospitality on this scale requires a great deal of preparation and forethought, down to the budget and shopping, and she makes it clear that you can get so bogged down in the details that you can forget why you're doing this. It's clear that this isn't a "let's impress the guests" kind of hospitality—it is the extension of the family life to the outsider. Yes, sometimes things are going to be a mess. But as she says, if you're family and you come in and see I'm still working on something, you pitch in—fold the laundry, stir the soup, unload the dishwasher. As I have written about many times before, most of my friends have small children. And they're always apologizing for what they perceive as things that would make me uncomfortable. The noise! The mess! Leaving me on my own for 5 minutes while they put the kids down to sleep! .... Stop worrying. I've been trying to tell you I'm just glad to be here. Thank you for letting me be part of your family, and give me something to do. This is real life, and this is what Butterfield writes about. A hospitality borne out of the recognition that we all may be fine communing together on Sunday morning, but then you're on your own until next week. She describes how we come together, for the high point of the Christian week, and in that time we are full, raw, and whole ... and then we splinter apart and return to our own homes and lives. There is little to no overlap, and this can leave people (myself included!) reeling somewhat as they attempt to readjust from that spiritual high to the drudgery of "real life". Hospitality can help with this. This is one way to interpret Galatians 6:10—doing good to all, especially your family in Christ. One of the questions I didn't really see an answer to was: how do you prioritize your own family if this is getting to be too much, i.e., is there one night every once in a while where you have one-on-one family time? Is it ever okay to just regroup and recharge, or are you inherently failing by taking some time off? The book is more or less addressed to married couples. She writes that, of course, the contributions of singles to hospitality are important, but then didn't offer any practical suggestions on what that might look like. I guess if I want those answers, I have to write the book myself. The kind of hospitality they can practice is facilitated by her being able to work from home, while homeschooling, and cooking, and cleaning, with the help of the whole family and whoever is on hand to assist. And that's amazing. I would love to be able to do that someday. Meanwhile: I work 40 hours a week and live by myself, so what I'm able to offer is, by necessity, on a smaller scale. It would NOT be safe or prudent for me to have the kind of open door policy they do, although the conviction creeping up on me is that it does need to be slightly more open than it is now. I think the thing that struck me most is her interpretation of 1 Corinthians 10:13 and how God will provide a way out of any temptation. She suggests, what if your extension of hospitality to someone IS that escape for them? What if, by providing a place for someone to go and a family to be part of, God is using your hospitality to protect them from the spiral of addiction? Butterfield is a conservative Presbyterian, and the theological portions of the book reflect not only the church environment she's been in for years, but also the thorough, measured approach you'd expect from someone who was a former professor. There wasn't much in here I disagreed with. If you have a sound understanding that all people have sinned and come short of the glory of God and that we are yet made in God's image, that SHOULD shape how you interact with them. I freely admit that is more difficult with some people than with others. I don't know where to start with my sprawling neighborhood, with the neighbors I wave to but don't speak to. I have no idea what the kind of hospitality she describes looks like in New England, where people can be neighbors for decades without actually knowing each other. Overall, while I have a few concerns that weren't addressed within this text, it is a thoughtful and helpful book that I would like to read again in a few years, to see how my circumstances and approach have changed. I would recommend that those who are interested in Christian hospitality (and yes, outreach) read this book. It is challenging and convicting, and having read it, I want to do more in this area. Disclaimer: I was provided with a free Advance Reader Copy by Amazon Vine in return for an honest review. I was not required to write a positive review.